Trying to cast the central role in his film of the Alice Sebold novel narrated by a murdered teen, and set in 1970s Pennsylvania, director Peter Jackson thought he'd find his girl in the U.S. But the young actresses he auditioned were too modern, and too schooled in the wiles of Disney Channel cuteness. Then he received a homemade screen test of Ronan, fresh off her role as the lying child in Atonement. Jackson, who had struck gold with teens before (Kate Winslet and Melanie Lynskey in Heavenly Creatures), knew he'd found his Susie. Not adorable but endlessly watchable, not calculating but super-smart about burrowing into a character, Ronan, now 15, transports Susie from innocent, ordinary life into a post-mortem dream world where she hovers over her grieving family like a guardian angel. 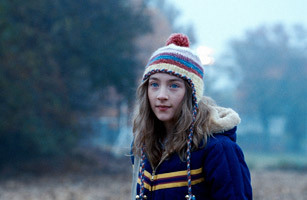 Dakota Fanning, you have competition as the wisest child-woman in movies. The name's prononced SIR-sha.